The new walkable beer tour explores Chicago's Loop & South Loop neighborhoods and pairs Chicago's vice history with craft beer. Chicago Beer Experience, Inc. (http://www.chicagobeerexperience.com) announced that it is opening a new, walkable beer tasting and bar tour in downtown Chicago in the Loop and South Loop neighborhoods on April 1, 2016. The new beer tour will combine craft beer tastings, particularly from Chicago and the Midwest, with Chicago’s vice history. Featuring stops at the Exchequer Restaurant & Pub, The Berghoff, Buddy Guy’s Legends, and Vice District Brewing, the three-hour walkable tour will cover approximately a mile and a half, starting in Chicago’s Loop neighborhood and ending in the South Loop. A trained tour guide will lead groups of up to eighteen people and will weave Chicago’s wicked history from the 1800s and 1900s with craft beer pairings and basic beer education. “Like our other tours, the new tour will provide Chicagoans and tourists alike a new, fun way to learn about the city and it’s beer,” said Bruce. Tours will typically run from Wednesdays through Saturdays in April through mid-November from 2:30-5:30 PM. Additional tours, including tours for private groups, will be available. Tickets are $59.90 per person and include craft beer tastings equally approximately four beers; non-beer tasting tickets are available for $33.90 per person. Tickets are available on the company’s website at http://www.chicagobeerexperience.com or by calling (312) 818-2172. About Chicago Beer Experience, Inc.
Chicago’s oldest beer tour company was started in 2011 when Bruce found a calling after being laid off from his corporate job. He combined tourism with a true passion – beer – and a company was born. Now entering its sixth year of operation, over 8,000 tourists have taken the company’s beer tours, which are highly rated on Yelp and TripAdvisor. The company features three guided walkable beer tasting and bar tours in Chicago neighborhoods: Lakeview & Lincoln Park, Bucktown & Wicker Park, and now the Loop & South Loop. 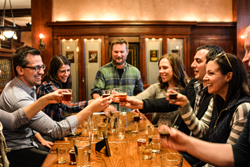 While each tour features different content, all tours combine the history of Chicago and its neighborhoods, basic beer education, and tastings of several different varieties of beers, most of which are from Chicago and the Midwest’s booming craft beer scene.